Featured Slot #1 on www.RarePepeWallet.com for one week starts tomorrow. NO RESERVE. Featured Slot #4 on www.RarePepeWallet.com for one week starts tomorrow. NO RESERVE. Lot 4 – The Four Elements of Rare Pepe. DJPEPE and MCPEPE will be music tokens on Tokenly in the near future. Series 4, 169 of each issued. NO RESERVE. Featured Slot #3 on www.RarePepeWallet.com for one week starts tomorrow. NO RESERVE. Lot 8 – Dank, shady and smokey. HIDDEN RESERVE. Lot 10 – The ‘Classics Pack’. 10 GOXPEPE, 10 SHITCOINCARD, 25 BUPEPE, and a DANKPEPE. This will be a NO RESERVE Alpha auction. So these fine dank Series 1 Rare’s will go home with you tonight if you’re Alpha enough. Lot 11 The original RAREPEPE. 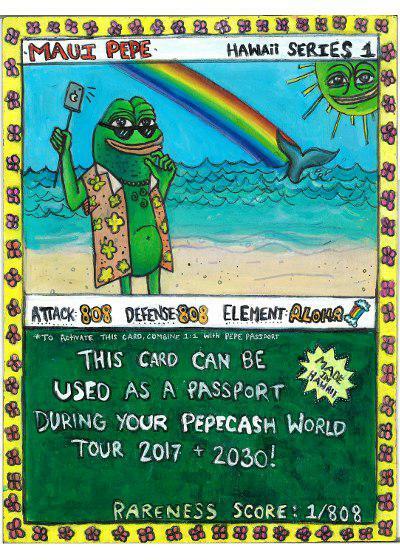 Bidding starts at 100K for this RAREPEPE. Featured Slot #2 on www.RarePepeWallet.com for one week starts tomorrow. NO RESERVE. Lot 15 PEPECITY – This City Never Sleeps. Rare Pepe 24/7. 10% of supply. HIDDEN RESERVE. WordPress setup, security hardening, managed hosting for one year, valued at $250 USD. Slot 1, RPW 1 Featured Slot #1 on www.RarePepeWallet.com for one week starts tomorrow. NO RESERVE. Alpha position. Sell more Rares. I’m gonna use a bit of shorthand today, my wrists need to last the distance. Glen is going to buy his pepe’s back from someone else?? okay, we’re on the way, but not at Reserve. Glen’s out. Lot 1, 1 TAJPEPE, 1 PEPEGANDHI. Wait until India wakes up to Rare Pepes! 1 billion Pepe collectors. Huge market. I’ll take 8K for a sale. okay, nobody at 8K so I will pass this one to the back? Wake Up Pepe’s, bidding on 5 RPDF’s!! Greed Roll! 7.5K to control 1% of RPDF! middle of the night in Europe and late on friday night in US. 5 x RPDF going three times. Lot 3 Featured Slot #4 on www.RarePepeWallet.com for one week starts tomorrow. NO RESERVE. Right hand side of RPW. Joe has lost his mind! have you already made a Rare Pepe Jack? which one, so people know what they’ll be seeing? wait a minute Jack you don´t actually have any certified pepes you made yourself? “DJPEPE and MCPEPE will be music tokens on Tokenly in the near future. ” @scrillaventura any news on that? ICQ, didn’t you say you’d start at 20K earlier? Who’s gonna be first to drop a 5K GIF bid? nobody got a come back on that? any more alpha GIF bids? Or Beta still image 1K bids? unless you’re forfeiting, which can drop to ICQ for 31K if that’s a live bid? @ICQCRYPTO was that a bid? did you want for 31K? I’ll extend to 48 hours on this, it’s a house lot. Who’ll start us off at 10K? 15K MU… that’s a bid? no typing… Sold to FR at Reserve of 20K. Lot 7 Featured Slot #3 on www.RarePepeWallet.com for TWO weeks, starts tomorrow. NO RESERVE. alrighty, we’re at 14K… do I have 15K? going three times… don’t spill it! “The ‘Classics Pack’. 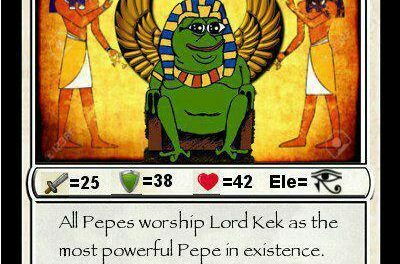 10 GOXPEPE, 10 SHITCOINCARD, 25 BUPEPE, and a DANKPEPE. I was pretty stunned when NM90 said NO RESERVE on this lot. Any other Alpha bidders in the House tonight? do we have a duel? I think Louis has run for the exit? What would a gladiator be without spectators? did you not know what you bid on? Shall we bid with memes? Who’s up for it today? Finest, you up for this one? with this ultra rare 1 of 10. I have one and I’m not selling. plus there’s only 25 BachelorPepe… 2/25 is nice to have. Slot 2, RPW Featured Slot #2 on www.RarePepeWallet.com for TWO weeks starts tomorrow. NO RESERVE. who’s got 10K for this advertising slot? you bidding it at 10K? What anime is that ?! Lot 15 – PEPECITY – This City Never Sleeps. Rare Pepe 24/7. 10% of supply. HIDDEN RESERVE. who’d like to kick off? anyone feeling real about PEPECITY? Okay… this lot is off the ta.. I have to ask, did you shoot first? all good if we not going there, back into the deck they go? this Lot is gonna get some crazy action or what? passing this lot in 3…. Why passing that lot? Where are the rules about passing ? wow folks… you do give it a GO!!! Glen is recording WTH message? what should nuke be, 25k? 50k? anyone gonna drop the bomb? What’s the reserve for lot 9? Lot 20 is One year of WordPress hosting with managed updates, daily backups and security hardening, value $250 USD, reserve price 75K. do you support .us ? How do you type that fast, RPN? Lots will be capped at 20 and we’ll aim for 3 hours max.